The old East Milton Avenue Bridge over the Rahway River in downtown Rahway, built in the 1950s, was a steel-stringer, four-span bridge that had developed severe corrosion and needed immediate replacement. The County of Union, called on PS&S to do the job. Concrete framing was the primary choice by PS&S for the bridge replacement due to its inherent long-term durability. The replacement bridge was redesigned to be a two-span, two-lane, pre-cast pre-stressed concrete-box-beam bridge. The spans are each about 90 feet and the bridge width, including sidewalks, is about 52 feet. The box beams are 39 inches deep with a variable depth latex modified concrete topping. 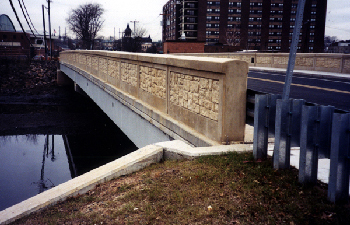 The concrete parapets are patterned concrete formed with form liners to have a stone appearance consistent with the architecture of the surrounding area. New concrete abutments and wing walls were constructed at each riverbank, replacing the original stone masonry abutments. The center pier utilized the existing circular foundation that had been the base of a swing bridge that had pre-dated the steel-framed bridge. A new cast-in-place concrete girder was placed on the existing foundation, cantilevering on each side to provide support for the box beams over the width of the bridge. 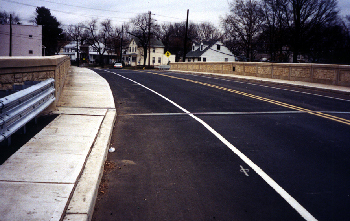 Since this portion of the Rahway River is subject to severe flooding, the profile of the bridge had to be reduced as much as possible. This could only be achieved through the use of the pre-cast pre-stressed concrete-box beams. Their use allowed the elimination of two intermediate piers and the resultant longer spans were easily handled with the shallow depth box beams. Additionally, special box beam sections were used to allow the passage of utility piping within the depth of the bridge, further reducing the obstruction of the river in flood stage.